The more affordable entry-level Pentax K-500 DSLR misses the weather-proofed body of the simultaneously released K-50 but is it better value? The Pentax K-500 is little brother to the numerically similar Pentax K-50 digital SLR released alongside it at the start of summer 2013, making it the new entry-level model in the K range, which also includes the Pentax K-5 II and the Pentax K-30. Offering the classic chunky DSLR design that sets it apart from that compact snapshot or smartphone, the K-500 is also £150 cheaper than the K-50 going by its manufacturer's asking price of £449.99, which includes camera body and interchangeable 18-55mm zoom lens. And, happily, in terms of handling our first impressions are that the cameras aren't wildly different, save for the notable fact that the cheaper model misses out on the K-50's weather-sealed body, an attribute normally only found on semi-professional cameras anyway. Headline specification for the K-500 is a 16.28 effective megapixel APS-C image sensor, selectable light sensitivity settings maxing out at a equivalent ISO51200, plus up to six JPEG images per second continuous shooting option. All these are the same as is offered by the K-50, which retails for £599.99 with lens. 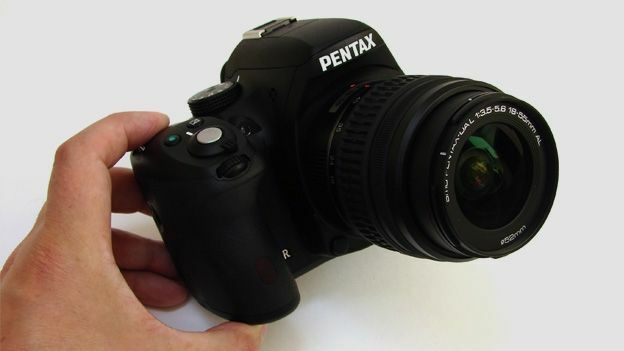 Like all Pentax digital SLRs the K-500 additionally comes with the advantage of built-in sensor shift image stabilisation, and there's also the ability to add an optional GPS unit if required, as this feature isn't incorporated by the camera out of the box. So the K-500's feature set doesn't feel as though it has been unduly pared back to achieve the asking price; indeed it more or less exactly matches that of the K-50, as does the body weight and dimensions. As we'd expect, we get Full HD video shooting too, at 1920x1080 pixels resolution and a maximum frame rate of a respectably smooth 30fps, with the ability to apply in-camera effects to clips, not just stills, if desired. We are also provided with automatic dust removal, to stop unwanted particles that might possibly intrude in the couple of seconds it takes to swap a lens affecting images. In a nutshell, if you're not planning on shooting with this model in the rain, it appears on paper you can save yourself £150 in going for the K-500 as opposed to the K-50. But will we in practice come to the same verdict? Pentax has taken the same slightly stark yet straightforward approach to the K-500's control layout as the K-50's - which at least means the DSLR is very easy to get to grips with from the off, as they're aren't a myriad customisable buttons and dials to add to the confusion, even though there is the ability to specify user settings via the top plate dial. Nevertheless, we could pick up this DSLR, set it to auto mode on the top plate shooting dial - the only choice highlighted in green - and simply point and shoot to get great results from the get go. Buttons are once again large and well labelled, while dials and control wheels are likewise large enough for the sausage fingered. Not everything is automatic, however. The pop-up flash needs to be raised manually before it will fire, with a button provided on the slope of the camera to one side for this purpose. Perhaps more surprisingly we also get a dedicated Raw/Fx button just behind the lens mount. Again this time saver furthers ease of use rather than being an exercise in over-cooking the range of functions. As this is a digital DSLR we get a big and bright eye-level optical viewfinder, which here offers the full 100% field of view, so what we see and the resultant image match up, as well as the standard Live View feature that allows the fixed back plate screen to also be used for shot composition and determining manual focus. Budget models usually provide a smaller resolution when it comes to back screens, but the 921K dots delivered by the 3-inch LCD of the K-500 is no different to the pricier K-50 model, and the back screen is clear and sharp enough to be able to determine whether your shot is in focus or not, which is ideal. As with its K-50 bigger brother, the K-500 provides the options of power via the usual lithium ion rechargeable battery and charger supplied in the box, or, more unusually, via four optional AA batteries. Without changing the look or feel of the DSLR this just provides an alternative should any user get caught short of juice when out and about sightseeing. That being said, the rechargeable option provides a perfectly respectable result, delivering a very fair 480 images from a full charge, which is slightly better than the 410 images provided by the pricier K-50 model. With the same sensor size and focal range as provided by the K-50 we were expecting some equally identical results from the K-500. As it is we weren't disappointed, with maximum resolution stills displaying plenty of detail even though 16 megapixels reads as slightly conservative for a DSLR these days in terms of pixel count. If we've a grumble it's that there's some slight loss of sharpness towards the corners of the frame at maximum wideangle setting, but nothing we wouldn't expect from a jack-of-all trades kit zoom. And if you mainly shoot natural rather than man made subjects you probably wouldn't notice at all. With the camera's responsiveness being swift enough to freeze movement in a frame even on its normal auto setting, this appears a perfect tool for families wanting better shots of the little 'uns. Colours are on the warm, well-saturated side by default - something it shares with Sony DSLR and SLT cameras. Really, any amateur photographer would be hard pressed to find fault. The same goes for video clips too. OK, so sound is mono, but the camera is equally quick to make its adjustments when filming, so any softening of the frame as you swap subjects doesn't stay that way for long. As an inexpensive all-in-one, the K-500 cuts the proverbial mustard. For low-light shooting too the camera is pretty decent: images don't start to break up truly until we push things to the top two settings of ISO25600 and ISO51200 - so stick to ISO12800 max for usable results, which is still better than the majority of entry-level models. If you're in the market for an entry-level DSLR such as the 16.2 megapixel Pentax K-500 there's a good chance that you're not going to be yet wedded to either the Canon or Nikon brands, which means that this easy-to-use means of getting more professional results stands a good chance of a fair hearing. It deserves one too, as this is one of the better propositions for your pound coins on the market today - if, that is, you're not otherwise tempted by the outdoor use possibilities of the weather proofed K-50, the K-500's bigger albeit £150 more expensive brother.